Let’s start with, that the bloody hell is a year in pixels? Well, It’s a Bullet Journal term. You take a glance at your year to see how your mood has been throughout. You have your own colour coding system, each colour represents a different mood. You then colour in the corresponding day with the mood you felt. At the end of the year, you then have an overview of your moods. There are many reasons why people do this. Personally, I like to see if there are any trends, that I can see, in my mood swings. That is what mine looked like when I first set it up. Of course, over time the squares will be filled with the corresponding colour. There are so many different ones out there. I find thoses so pretty !! 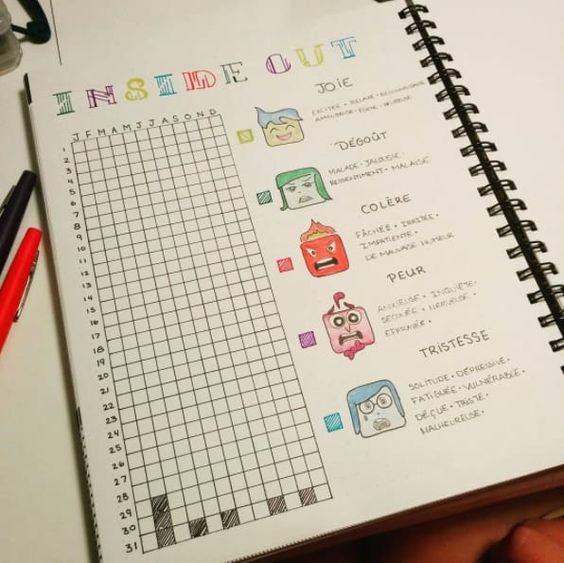 I specially like the inside out one, but however … i’m not sure how good it’d be to remember and color it. My best take would be to have one every month, similar to my habit tracker so it’s in the same place and i’d tend to forget less perhaps?